Toyota has come up with the all new Yaris sedan in the year 2018. The prices introduced for the car are ₹ 8.75 lakh for the base petrol and that can increase up to ₹ 14.07 lakh for the petrol automatic versions. The company has not released the diesel variant of the car in the market as yet but that is soon to be up for sale. And it is this Yaris launch with which Toyota is expecting a 10% surge in growth in 2018. Last year the company made a sale of 1.4 lac cars and utility vehicles in the Indian automobile market. The Yaris is Toyota’s very first highly contested compact sedan introduced in India. The Yaris comes with a 1.5-litre petrol engine with options available for both manual and automatic transmission. 4 variants of the car are available, such as - J, G, V, and VX. The bookings for the new sedans began on April 25 and they were sold on the 18th of May. The increasing demand for Yaris which is to ultimately cause the growth spurt was evident from its sale of a total of 1000 units on it very launch day. The Toyota Yaris comes with leather wrapped interiors which gives it a royal and classy look. Apart from that it has inbuilt ambient lighting. The car includes safety features like - 7 airbags, ABS and EBD. It has rear parking camera with both rear and front parking sensors. 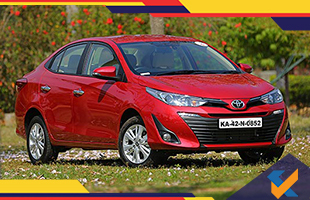 The all new Toyota Yaris ranks below the Corolla Altis and rivals against the big shot sedans of Indian market like - Maruti Suzuki Ciaz, Honda City, Hyundai Verna, Skoda Rapid and Volkswagen Vento. The company is very optimistic about Yaris sales in India and they continue to be hopeful since its launch turned out to be a big hit in the market.